I’ve been trying to learn more with Photoshop lately. Berry had a really awesome tutorial in her blog using the dodge & burn tools, and so I sat around today playing with those tools. Of course, then I was unhappy with everything and ended up putting an “antique photo” filter over the whole deal. But it’s not terrible. I hit the gym earlier today for the first time in almost 2 months, so I’m sore sore sore. I think it’s bedtime. I’m writing this blogpost while on location. 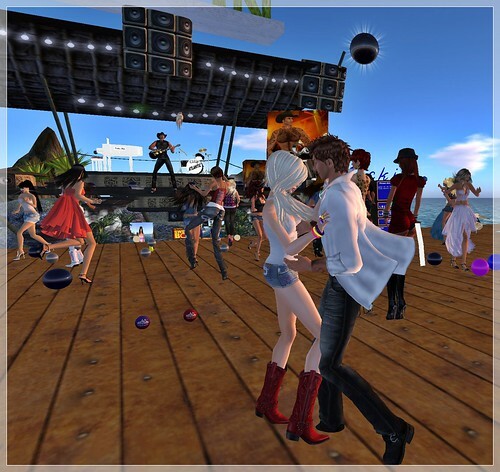 We’re out listening to Colt Arun, a live singer in SL who does country music. I’m a Texas girl, and I used to hit the country bars a LOT in my 20s, and he sounds a lot like the house band singers I used to listen to. Not bad at all. Of course, Eva almost got in a fight with some girl who had toilet paper stuck to her behind. But it’s just not a complete country evening until someone gets smacked. 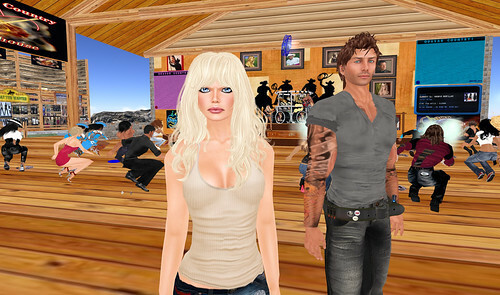 I’ve been pretty blessed to get to know so many wonderful artists [that’s what I think of most of my creator friends are] in Second Life. What always amazes me is where they find their inspiration from. One finds it from nature, another from films, another from music, so on and so forth. Most of my inspiration for SL photos comes from others, either because of a mood they have put me in, or in items they have created. When my friend Gauge gave me this mirror, an image popped into my head. I knew the outfit and the hair and skybox I wanted to use. And as I was beginning to prepare for the photo, I had my music on shuffle and “I Am Ready For Love” by India.Arie came on. [Yes, I totally had to get the song after hearing it on American Idol. Don’t hate.] After that…the photo came easily. And no no, I’m not emo or heartbroken or in love or anything of the sort. 🙂 Well, I am a little sad. I had to clean off a parcel today and….well, you know. But mostly this photo is just one that kind of formed in my head. Is the photo too big? lol See, I’ve been having issues with this lately. My blog isn’t on any feeds, so I don’t feel like I need to conform to prescribed widths like I do over in the style blog. But I don’t want it to be all crazy either. I really hate that I don’t start fully waking up until this time. [It’s just about 7 in my neck of the woods]. I seriously think I’m living in my own time zone. But, hey, that’s ok. That is OH-KAY. Hm. I think I’ll go find someone to bother now. Not too much to talk about today. Well, that’s not true. There’s probably tons I could say! But I’m choosing to keep my thoughts and opinions to myself for the moment. Not for any other reason than the fact that I can. 🙂 Oh, and because some people are whiny and if I said what I thought, they’d get more whiny, and Dios mio, who wants to see that? I suppose it’s time to tuck my pretty black & white skybox away and go to bed. Saturdays are my busy days during the daytime, and I need my sleep.